We are proud to have received a prestigious silver award from Visit Britain the UKs official travel guide. This recognises extremely high standards of quality, cleanliness and service. 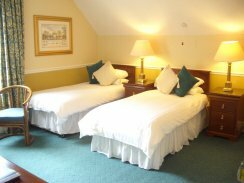 Recently refurbished and continually refined, the rooms are bright, spacious and well appointed with quality furnishings and fittings. To offer you the comfort of home they contain 26"LCD televisions with freeview, mini fridges, ironing facilities, hair dryers, hospitality trays, bath robes and toiletries. Each room can be configured as either a double with super-king (6ft) or two single beds.